Shiner. Eva H.D. Mansfield Press. Toronto, Ontario. 2016. Eva H.D. is back and she has brought all her dark charms with her. Her first book, Rotten Perfect Mouth, stormed through our offices a little more than a year ago (you can read that blog here: http://michaeldennispoet.blogspot.ca/2015/07/rotten-perfect-mouth-eva-hd-mansfield.html ) and tore up everything in sight. Since we opened the doors for business Today's book of poetry has had over 1,500 new volumes of poetry land on our desk and we liked Rotten Perfect Mouth as much as any of them. So you can understand why expectations were high when Shiner grumbled through the mail slot. Lucky for us that Eva H.D. sets some very high standards for herself, there are no mimicking birds here. 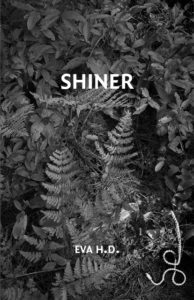 Shiner is a completely apt description, these poems smack you up the side of the head whether you like it or not. We wouldn't be the least surprised if they left a mark. She even leaves some breadcrumbs, small trails of beauty. the Rocher Perce to our port side. Made apple fritters for breakfast. torqued like a Mobius strip. pitching and scending into dusk. Blueberry pie in the oven. Eva H.D. spends considerable time and energy searching out and speculating over the forgiveness game. These poems are pulled taut and strummed hard by tension even when they strive for a certain type of peace. The search for tranquility isn't entirely futile but Eva H.D. is as suspicious about horse-piss promises as she is smitten by peaches. Today's book of poetry really enjoyed Eva H.D. 's riffing on travelling across Canada. We too love the idea of eating a bacon sandwich in every province. The thing about Shiner is how complicit Eva H.D. makes the reader feel, she has an uncommon common touch that draws the reader in close. Cleverly enough H.D. 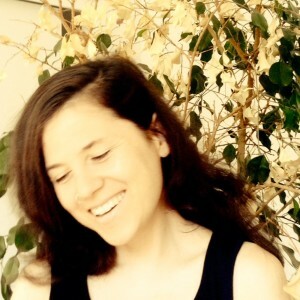 has added an instant connect device to most of these poems, you are inside them and involved before you knew you cared about Toronto, or baseball or wild salmon. If Today's book of poetry had to distill Eva H.D. 's style, label it, we'd call it "vigorously hopeful despair." This is a suspicious poet, doubtful and leery of our best intentions, doubtful and leery about her own. And then along comes optimism. It's in there like a twist of lemon in your drink. yelling and dog dares and heights. that noisy, dizzying dog dare. These poems burn. Shiner affirms what anyone/everyone who read Perfect Rotten Mouth already knows, Eva H.D. is a poetry assassin. These poems are killer. —Eavan Boland, judge’s citation on awarding the Montreal International Poetry Prize.